Background: Hepatitis is a health problem affecting millions of people worldwide and it is the major risk factor for liver cirrhosis. In India, many plants are used to treat hepatitis. But little is known about the effects of (-)-epicatechin a bioactive compound of Phyllanthus niruri (PN) in hepatitis rats. Objective: The present study was designed to explore the antioxidant property of (-)-epicatechin isolated from PN in D-Galactosamine (D-GalN) induced hepatitis rats. Materials and Methods: The rats are divided into five groups as per the experimental design. (-)-Epicatchin pretreatment was given to the hepatitis rats for 21 days and biochemical analysis was carried out. The hepatic antioxidant enzymes like superoxide dismutase (SOD), catalase (CAT), glutathione peroxidase (GPx), and glutathione reductase (GR), glutathione S-transferase (GST), reduced glutathione (GSH), and malondialdehyde (MDA) and serum markers aspartate aminotransferase (AST), alanine aminotransferase (ALT), alkaline phosphatase (ALP), albumin, and bilirubin are estimated. Results: All the antioxidant enzymes activities and albumin levels are depleted in hepatitic rats. Whereas GST, ALP, AST, ALT activities and MDA, and bilirubin levels are elevated in hepatitis rats, (-)-epicatechin pretreatment increased all the antioxidant enzymes and decreased the GST, ALP, AST, ALT, and MDA levels in hepatitis rats. However, histopatholoigic studies also proves that (-)-epicatechin pretreatment decreased the tissue damage in hepatitis condition. This is the first report on the antioxidant enzymes and hepatoprotective effect of (-)-epicatechin in hepatitis rats. Conclusion: From this study, we conclude that (-)-epicatechin treatment decreased the oxidative damage in hepatitis rats. Abbreviations used: Phyllanthus niruri (PN), D-Galactosamine (D-GalN),superoxide dismutase (SOD), catalase (CAT), glutathione peroxidase (GPx), and glutathione reductase (GR), glutathione s transferase (GST), reduced glutathione (GSH) and malondialdehyde (MDA) aspartate aminotransferase (AST), alanine aminotransferase (ALT), alkaline phosphatase (ALP), World Health Organisation (WHO), Indian Institute of Science (IISc), Nicotinamide adenine dinucleotide phosphate (NADPH), thiobarbituric acid reactive substances (TBARS). The present study was carried out to know the impact of (-)-epicatechin on antioxidant enzymes activities in hepatitis rats. From this study, we found that the antioxidant enzymes SOD, CAT, GPx, GR, GSH depleted in hepatitis rats and increased with (-)-epicatechin in hepatitis rats. 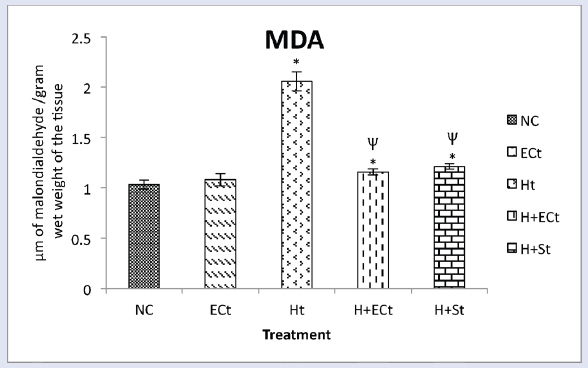 MDA levels increased in hepatitis rats and decreased with (-)-epicatechin in hepatitis rats. From this study, we concluded that (-)-epicatechin will be useful to treat hepatotoxicity in rats. Hepatitis is a major public health problem worldwide, responsible for considerable morbidity and mortality from liver disease. According to World Health Organization (WHO) report, an estimated 600,000 persons die each year due to the acute or chronic consequences of hepatitis. Types of hepatitis are A, B, C, D, E, F, and G. Developing countries like India is also struggling to manage the impact of hepatitis along with the growing burden of obesity, diabetes, hypertension, and coronary heart disease. Hence, hepatitis remains as clinical challenge and a problem of great importance today. Hepatitis may be induced by virus, alcohol, lipid oxidation products, and various drugs. D-Galactosamine (D-GalN) is a hepatotoxicant, causing liver injury, which is closely related to human viral hepatitis due to their similarities in morphologic and functional features of hepatitis. Liver damage induced by D-GalN generally reflects in disturbance of liver cell metabolism, which leads to characteristic changes in the serum enzyme activities. It has been reported that GalN induces damage in rat hepatocyte, which results in increased production of reactive oxygen species. Phyllanthus niruri (PN) Linn has been used in Ayurvedic medicine for over 2000 years and has been used in wide number of traditional ailments such as jaundice, gonorrhea, frequent menstruation, diabetes and liver-related disorders. In PN many phytochemical constituents like flavonoids, alkaloids, terpenoids, lignans, polyphenols, tannins, coumarins, and saponins are seen. The bioactive compounds of Phyllanthus are astragalin, catechin, (+),(-)-epicatechin, catechin-3-o-gallate, epicorilagin, quercetin, geraniin, phyllnirurin, cymene, estradiol, fraternusterol, gallocatechin, limonene, lupeol, niranthin, mirphyllin, phyllanthin, hypophyllanthin, and so on. The present investigation was designed to explore the antioxidant and hepatoprotective effect of (-)-epicatechin in D-GalN-induced hepatitis in rats. There were no reports available on the effect of (-)-epicatechin on antioxidant defense system enzymes in hepatitis in rats. To the best of our knowledge, this is the first reported data on the antioxidant activity and hepatoprotective effect of (-)-epicatechin during hepatitis condition. All chemicals used in the present study are obtained from Sigma (St. Louis, MO, USA), Fisher Scientific (Pittsburg, PA, USA), Merck (Mumbai, India), Ranbaxy (New Delhi, India), and Qualigens (Mumbai, India). Fresh plants of PN were locally collected in the months of October and November 2014 from seven hills of Tirupati, Andhra Pradesh, India, identified, and authenticated by botany taxonomist, Dr. Madhava Chetty, Department of Botany, S.V. University. A voucher specimen No. 2151 was retained in the Department of Botany, S.V. University, Tirupati. The bioactive compound of PN i.e., (-)-epicatechin was extracted by different methods. PN was grinded and ethanol added. The mixture was filtered and dried by using a rotary evaporator. The mixture is then washed with hexane. All other experimental work was carried out by using thin layer chromatography (TLC) and high-performance liquid chromatography (HPLC) and isolated pure bioactive compound (-)-epicatechin. The rats are given D-GalN to induce hepatitis. Hepatitis was confirmed by estimating AST, ALT, and ALP in serum. AST, ALT, and ALP activities increased in rats, our results are similar with those from hepatitis subjects. This experiment was carried in male Wistar rats (3 months old, weighing 180 ± 200 g) obtained from Indian Institute of Science (IISC), Bangalore. The animals were kept under standard laboratory conditions (temperature (27 ± 2°C), natural light dark cycle (photoperiod of 12-h light and 12-h dark), and humidity of 55–60%. The rats were given standard pellets diet (Lipton Rat Feed Ltd., Pune) and water ad libitum throughout the experimental period. The study design was approved by the animal ethical committee (Resolution No. 10/08/a/CPCSCA/IAEC/SVU/09-10/ZOOL/KRS/Dt.25.09.2009). After 7 days of acclimatization, animals were divided into five groups of six rats each. Group I normal control (NC): These rats received saline for 21 days and served as normal control. Group II (-)-epicatechin compound control treatment (Et): These rats received pretreatment of bioactive compound of PN (epicatechin 50 mg/kg body weight) for 21 days. Group III hepatitis control (Ht): A single injection of D-GalN (800 mg/kg body weight) was given intraperitoneally for the induction of hepatitis 48 h before sacrifice. Group IV hepatitis + (-)-epicatechin – 50 mg/kg body weight) treatment (H+Et): Hepatitis rats received pretreatment of bioactive compound ((-)-epicatechin) orally for 21 days. Group V hepatitis + Silymarin treatment (H+St): Hepatitis rats received pretreatment of standard drug Silymarin (100 mg/kg body weight) orally for 21 days. After 21 days of treatment, all the rats were sacrificed. Blood samples were collected in sterile plastic tubes and serum was separated by centrifugation at 3000 rpm for 10 min at 4°C. Liver tissue was quickly removed, washed in ice cooled 0.9% NaCl, and immersed in liquid nitrogen and immediately stored at -80°C for further biochemical analysis. Liver tissue was also used for histopathologic studies. The isolation of mitochondria was done by using the methods of Kaushal et al. The liver was placed in beakers containing chilled (-4°C) isolation media, which contained 0.25 M sucrose, 10 mM Tris-HCl buffer, pH 7.4, 1 mM EDTA, and 250 µg BSA/mL. The tissues were minced and washed repeatedly with the isolation medium to remove adhering blood and 10% (w/v) homogenates were prepared using homogenizer. The nuclei and cell debris were sedimented by centrifugation at 650g for 10 min and discarded. The supernatant was subjected to a further centrifugation at 7500g for 10 min. The resulting mitochondrial pellet was washed by suspending gently in the isolation medium and by re-sedimenting at 7500g for 10 min. Finally, the mitochondrion was suspended in the isolation medium. SOD activity in liver was measured by the method of Misra and Fridovich. The absorbance was read at 340 nm for 4 min and the activity was expressed as the amount of enzyme that inhibits the oxidation of epinephrine by 50%, which is equal to one unit. Whereas CAT activity was determined in the liver as described by Aebi using Triton X-100 by measuring the absorbance at 240 nm for 60 s on a UV-Spectrophotometer (Hitachi U-2800). GPx activity was estimated by Flohe and Gunzler. GR activity was measured by the method of Carlberg and Mannervik by monitoring the oxidation of nicotinamide adenine dinucleotide phosphate (NADPH) at 340 nm for 3 min. However, the levels of reduced glutathione (GSH) in liver was measured as described by Akerboom and Sies. GST activity was assayed by the method of Habig et al. Protein content in liver was determined by the method of Bradford. The extent of liver lipid peroxidation in term of thiobarbituric acid reactive substance (TBARS) formation was measured as described by Ohkawa et al. AST, ALT, ALP, albumin, and bilirubin are estimated in serum by kit methods. The free radical scavenging activity, i.e., DPPH of PN was determined spectrophotometrically by the method of Brand-Williams et al. The H2O2 free radical scavenging activity of PN is estimated by the method of Ruch et al. The reducing power was determined according to the method of Oyaizu. The liver tissues were fixed for 48 h in 4% paraformaldehyde, dehydrated by passing them successively in different mixtures of ethyl alcohol–water, cleaned in xylene, and embedded in paraffin. Sections of liver (3µ thick) were prepared, stained with hematoxylin and eosin (H& E 10×), and mounted using neutral (DPX) mountant for microscopic observation. Results are expressed as means ± standard deviation (SD). Variance analysis was done with Duncan's multiple comparison tests on data using the SPSS (Version 15, SPSS Inc., Chicago, IL, USA) and MS Office, Excel software for the significance of the main effects (factors), and treatments along with their interactions. Statistical significance was set at P less than 0.05. The P values are presented with the obtained data. The free radical scavenging activity of PN was assessed by using DPPH, hydrogen peroxide, and reducing powers shown in [Figure 1]. 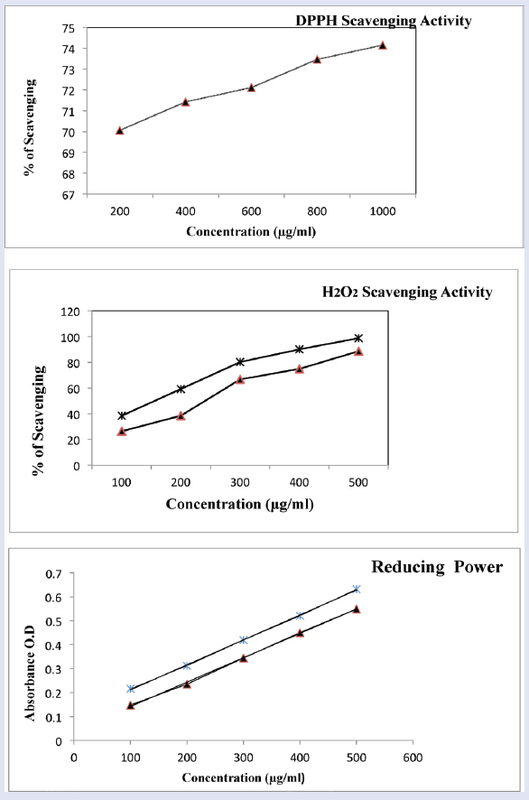 Interestingly, DPPH, hydrogen peroxide, and reducing power activity of PN demonstrated remarkable free radical scavenging effects with significant activity when compared with standard antioxidants. DPPH, hydrogen peroxide, and reducing powers of PN were increased with increase in the concentration levels. This shows that PN possess free radical scavenging activity [Figure 1]. [Figure 2] depicts the activities of antioxidant enzymes. When compared with normal control, the activities of all the liver antioxidant enzymes (SOD, CAT, GPx, GR, and GSH) are significantly decreased in hepatitis rats. However, (-)-epicatechin pretreatment in hepatitis rats SOD, CAT, GPx, GR, and GSH activities are increased. GST activity was increased in hepatitis condition. However (-)-epicatechin supplementation reverted back the GST activity to near normal in hepatitis rats. Our results showed that (-)-epicatechin pretreatment brought back all the antioxidant enzymes near to normal in hepatitis rats. Silymarin drug also showed a considerable effect in reverting the effects of hepatitis treated rats for all the enzymes. Oxidative tissue damage marker MDA levels significantly (P < 0.05) increased in D-GalN-induced hepatitis control rats than in normal control. However, (-)-epicatechin pretreatment progressively reduced (P < 0.05) oxidative tissue damage by decreasing the MDA levels compared with hepatitis control rats, which suggests that (-)-epicatechin could be able to retarded the hepatic tissue damage under D-GalN-induced hepatitis. Silymarin drug also showed the same effect in hepatitis rats [Figure 3]. Serum AST, ALT, ALP, bilirubin, and albumin are used as biochemical markers of hepatic tissue damage. Serum AST, ALT, ALP, and bilirubin levels significantly increased (P < 0.05) and albumin levels decreased in hepatitis rats over normal rats. However, pretreatment of (-)-epicatechin depleted AST, ALT, ALP activities, and bilirubin levels in hepatitis rats. But albumin levels elevated in hepatitis rats. (-)-Epicatechin supplementation prevented the hepatic tissue damage in hepatitis rats. Hence, all the serum markers levels are came back to near normal levels [Table 1]. In the present study, we observed degeneration of central vein, hepatocytes, and sinusoids in D-GalN-induced hepatitis control rats. Free radical production under hepatitis condition is more, hence in this condition, hepatic cell damage is seen. However, with (-)-epicatechin pretreatment, we observed regeneration of central vein, hepatocytes, and sinusoids in hepatitis rats. Which further confirms the hepatoprotective effect of the (-)-epicatechin. (-)-Epicatechin alone and Silymarin treatments did not show any change in the architecture of the liver as compared with normal control [Figure 4]. Free radical production causes extensive damage to tissues and biomolecules leading to various disease conditions like diabetes, hepatitis, and cancer. Herbal treatment protects tissue damage against many diseases. Hence, an alternative solution to the problem is to consume natural antioxidants from food supplements and traditional medicines. In the present study, we carried out the free radical scavenging activity of DPPH, H2O2, and reducing power of PN. These free radical scavenging assays have provide a good method to know the antioxidant activity. In this study, DPPH, H2O2, and reducing powers of PN showed good free radical scavenging activity [Figure 1]. Oxidative damage due to oxidative stress is the failure of the cell's defense against the deleterious effects of harmful agents. In our study, D-GalN decreased the activities of SOD and CAT enzymes in hepatitis rats. The inhibition of SOD activity in hepatitis rats may be attributed to inefficient scavenging of ROS, which might be implicated to oxidative inactivation of SOD. CAT is a heme protein, which decomposes hydrogen peroxide and protects the tissues from highly reactive hydroxyl radicals. Our findings are supported by the previous studies, decline of SOD and CAT activity in D-GalN-induced hepatitis rats. However, pretreatment of (-)-epicatechin remarkably increased the SOD and CAT activity in D-GalN-induced hepatitis, it was indicated that (-)-epicatechin significantly prevents the superoxide anions and hydrogen peroxide radicals by SOD and CAT in D-GalN-intoxicated rats [Figure 2]. In our study, we observed the depleted activities of GR and GPx in hepatitis rats. D-GalN decreased the GPx and GR activities due to the free radicals, which led to interaction with these proteins and modulation of their action. GPx reduced the H2O2 to water in the presence of GSH and GR reduce the oxidized glutathione into reduced glutathione, which is essential for defense against free radicals. However, pretreatment of PN bioactive compound (-)-epicatechin substantially enhanced the GPx and GR activity either may be synthesis of GSH levels or may be decreased the free radicals by their antioxidant activity. Our results show the strong evidence of hepatoprotective effect of (-)-epicatechin that significantly reduces hepatic tissue damage in hepatitis rats [Figure 2]. GST plays a vital role in the detoxification of electrophiles produced by ROS via catalyzing the conjugation of electrophiles with GSH. In the current study, we reported that GST activity was increased in hepatitis rats. GST can remove free radicals, and their levels can reflect the antioxidant capacity of the tissue. Excessive oxidation in cells that causes reduction in GSH/GSSG may also affect other cellular events, hence GST activity was increased. However, (-)-epicatechin pretreatment decreased GST activity in hepatitis rats. (-)-Epicatechin supplementation may decrease the production of toxic free radicals in hepatitis rats, so GST activity may decrease [Figure 2]. Glutathione is an important protein thiol that protects the cells against cytotoxic agents such as reactive oxygen species. GSH profoundly appeared in liver tissue, thus the liver has highly sophisticated protection from free radicals. 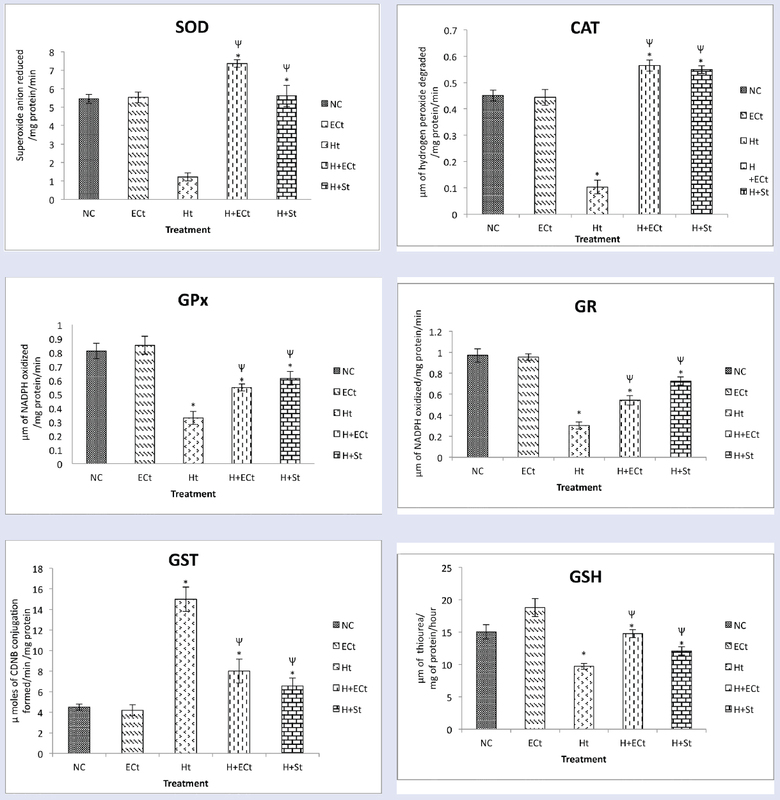 However, in our study, GSH levels significantly decreased under D-GalN intoxication, indicating that GSH is highly vulnerable to toxic free radical mediated tissue damage. These results are in accordance with those of the earlier investigations that noticed that the tissue antioxidant status was being operated at diminished level in D-GalN-induced hepatitis, which may be due to either increased degradation or decreased synthesis of glutathione. PN bioactive compound (-)-epicatechin increased the GSH levels in D-GalN-induced hepatitis rats. Pretreatment of (-)-epicatechin significantly defense the free radicals induced by D-GalN due to its free radical scavenging activities which reflected either decreased the utilization of GSH or may be enhance the synthesis the GSH by increasing the activity of GR. Oxidative stress has been reported as one of the major causes of GalN-induced liver damage. Excessive production of free radicals resulting from oxidative stress can damage lipids. Increased lipid peroxidation in the organism is attenuated by the enzymatic antioxidant system and small molecule antioxidants. In the current experiment, we observed higher levels of MDA in hepatitis rats than normal control rats. The current data are in agreement with previously reported data., However, D-GalN intoxication promotes to increase the free radical production in liver tissue, which can lead to tissue damage. These higher levels may due to the decreased activities of antioxidant enzymes in hepatitis rats. (-)-Epicatechin supplementation decreased the MDA levels in hepatitis rats. (-)-Epicatechin pretreatment may decrease the production of free radicals in hepatitis rats, this may cause downregulation of MDA levels. Thus, (-)-epicatechin had shown a potent chain breaking agent, which may prevent reaction between free radical and cell membranes interactions and protect the liver tissue under D-GalN intoxication. AST, ALT, and ALP are the most common liver marker enzymes. AST is present in both the cytoplasm and mitochondria of hepatocytes, whereas ALT is present only in the cytoplasm. ALP is an enzyme that transports metabolites across cell membranes. ALT, AST, and ALP are also aminotransferases that could act as liver biomarkers. Many reports reported that under disease conditions, serum marker levels increases due to tissue damage and oxidative stress. 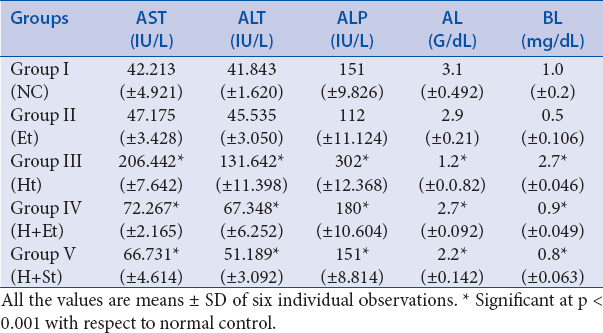 In hepatitis condition, AST, ALT, and ALP activities increased in serum. In our results, similar consequences are observed, AST, ALT, and ALP activities elevated in serum due to D-GalN intoxication. (-)-Epicatechin pretreatment significantly reduces the elevated serum AST, ALT, and ALP activities in hepatitis rats. It was suggested that (-)-epicatechin possesses hepatoprotective activity in hepatitis rats [Table 1]. (-)-Epicatechin has a great potential against hepatitis condition. So (-)-epicatechin can be used as a health promoter for developing novel functional food ingredients and pharmaceutical preparations. In the current investigation, we reported an upregulation of bilirubin and a downregulation of albumin in the serum of hepatitis rats. During hepatitis condition, liver functions abnormally, hence all the hepatic markers are altered, which results in increased levels of bilirubin, accompanied by decreased levels of albumin. Our results are in accordance with the previous studies showing that elevated levels of bilirubin and depleted levels of albumin in D-GalN-induced hepatitis. However, (-)-epicatechin supplementation significantly declined the bilirubin and increased the albumin in hepatitis rats when compared with hepatitis control rats. (-)-Epicatechin pretreatment may suppressed the D-GalN toxicity in hepatic tissue by reducing the free radicals generation, which is reflected in the modulation of hepatic function as a result. We observed a decline in bilirubin and increased levels of albumin in hepatitis rats [Table 1]. 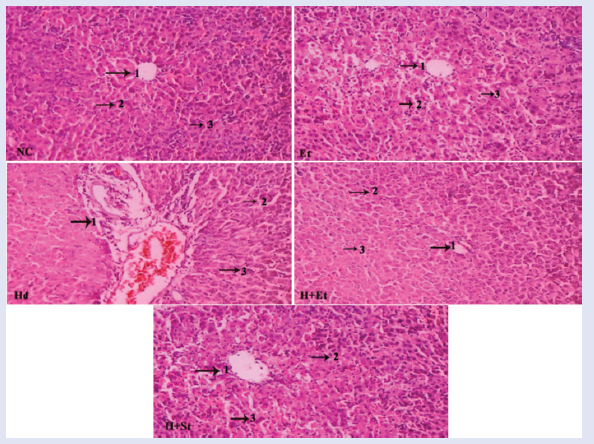 Histopathologic studies of hepatitis liver showed disruption of sinusoids, degeneration of central vein, and hepatocytes, proving that free radicals production causes hepatic damage under hepatitis condition. When hepatitis rats pretreated with (-)-epicatechin, sinusoids, central vein and hepatocytes have regenerated. (-)-Epicatechin minimizes the production of free radicals in hepatitis-treated rats and protects the liver tissue from hepatitis-induced oxidative damage [Figure 4]. This is the first report on hepatoprotective and antioxidant effect of (-)-epicatechin in hepatitis rats. From this study, we conclude that (-)-epicatechin bioactive compound isolated from PN modulated the antioxidant enzymes in hepatitis rats and also decreased the oxidative damage. Hence, (-)-epicatechin can be used as hepatoprotective and antioxidant agent against hepatitis. But more pharmacologic research work is required to find out the exact mechanism of (-)-epicatechin for its hepatoprotective activity in hepatitis condition. The authors are grateful to the Department of Science and Technology (DST), New Delhi, India for the sanction of Young Scientist Fast Track Project the No. SERC/LS-387/2012, dated 02/09/2014. World Health Organization. Weekly Epidemiological Record No.40. 2009;84:405-20. Ilyas UK, Katare DP, Aeri V. Comparative evaluation of standardized alcoholic, hydroalcoholic, and aqueous extracts of Phyllanthus maderaspatensis Linn. against galactosamine-induced hepatopathy in albino rats. Phcog Mag 2015;11:277-82. Tatiya AU, Surana SJ, Sutar MP, Gamit NH. Hepatoprotective effect of poly herbal formulation against various hepatotoxic agents in rats. Phcog Res 2012;4:50-6. Bell JR, Donovan JL, Wong R, Waterhouse AL, German JB, Walzem RL, et al. (-)-Catechin in human plasma after ingestion of a single serving of reconstituted red wine. Am J Clin Nutr 2000;71:103-8. Tadesse A, Hymete A, Bekhit AA, Mohammed SF. Quantification of total polyphenols, catechin, caffeine, l-theanine, determination of antioxidant activity and effect on antileishmanial drugs of Ethiopian tea leaves extracts. Phcog Res 2015;7:7-14. Nakagami T. DECODA Study Group. Hyperglycaemia and mortality from all causes and from cardiovascular disease in five populations of Asian origin. Diabetologia 2004;47:385-94. Donovan JL, Dave L, Stremple P, Andrew L, Waterhousea A. Analysis of (1)-catechin, (2)-epicatechin and their 39- and 49-O-methylated analogs: a comparison of sensitive methods. J Chrom B 1999;726:277-83. Kaushal R, Dave KR, Katyare SS. Paracetamol hepatotoxicity and microsomal function. Environ Toxicol Pharmacol J 1999;1:67-74. Misra HP, Fridovich I. The role of superoxide anion in the autooxidation of epinephrine and a simple assay for superoxide dismutase. J Biol Chem 1972;247:3170-5. Aebi H. Catalase in vitro. Methods Enzymol 1984;105:125-6. Flohe L, Gunzler WA. Assays of glutathione peroxidase. Methods Enzymol 1984;105:114-21. Carlberg I, Mannervik B. Glutathione reductase. Methods Enzymol 1985;113:484-90. Akerboom TP, Sies H. Assay of glutathione, glutathione disulfide and glutathione mixed disulfides in biological samples. Methods Enzymol 1981;77:373-82. Habig WH, Pabst MJ, Jacoby WB. Glutathione S-transferases the first enzymatic step in mercapturic acid formation. J Biol Chem 1974;249:7130-9. Brand-Williams W, Cuvelier ME, Berset C. Use of a free radical method to evaluate antioxidant activity. Lebens Wiss Technol 1995;28:25-30. Ruch RT, Cheng SJ, Klaunig JE. Spin trapping of superoxide and hydroxyl radicals. Methods Enzymol 1984;105:198-209. Oyaizu M. Studies on products of browning reactions: antioxidative activities of products of browning reaction prepared from glucosamine. Jpn J Nutr 1986;44:307-15. 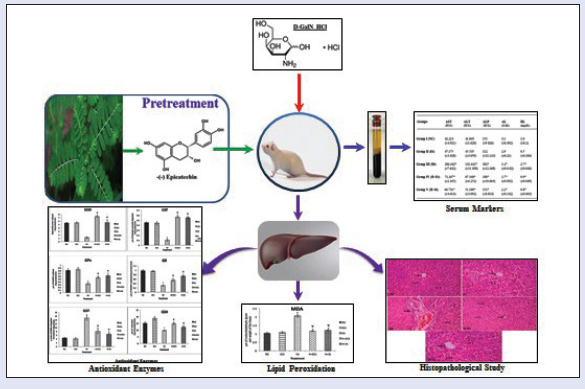 Yanling S, Jie S, Hui H, Hui G, Sheng Z. Hepatoprotective effects of Ganoderma lucidum peptides against D-galactosamine-induced liver injury in mice. J Ethnopharm 2008;117:415-9. Jones DP. Redox potential of GSH/GSSG couple: assay and biological significance. Methods Enzymol 2002;348:93-112. Adaramoye AO, Adeyemi EO. Hepatoprotection of D-galactosamine-induced toxicity in mice by purified fractions from Garcinia kola seeds. Basic Clin Pharm Toxicol 2006;98:135-41. Han K, Hashimoto HN, Shimada K, Sekikawa M, Noda T, Yamauchi H, et al. Hepatoprotective effect of purple potato extract against D-galactosamine induced liver injury in rats. Biosci Biotechol Biochem 2006;70:1432-7. Upaganlawar A, Gandhi H, Balaraman R. Effect of vitamin E alone and in combination with lycopene on biochemical and histopathological alterations in isoproterenol-induced myocardial infarction in rats. J Pharm Pharmacother 2010;1:24-31. Joseph JA, Ayyappan UP, Sasidharan SR, Mutyala S, Goudar KS, Agarwal A. Ameliorative effect of Phytocee™ Cool against carbon tetrachloride-induced oxidative stress. Phcog Res 2014;320-5. Hussein J, Refaat E, Morsy S, Medhat D, Oraby F. Green tea attenuates experimental hepatitis in context of oxidative stress. J App Pharm Sci 2013;3:124-8. Girish C, Pradhan SC. Hepatoprotective activities of picroliv, curcumin, and ellagic acid compared to silymarin on carbon-tetrachloride-induced liver toxicity in mice. J Pharm Pharmacother 2012;149-55. Uysal A, Zengin G, Mollica A, Gunes E, Locatelli M. Yilmaz T, et al. Chemical and biological insights on Cotoneaster integerrimus: A new (-)-epicatechin source for food and medicinal applications. Phytomedicine 2016;23:979-88. Wong MC, Portmann B, Sherwood R, Niemela O, Koivisto H. The cytoprotective effect of alpha tocopherol and daidzein against D-galactosamine induced oxidative damage in the rat liver. Metabolism 2007;56:865-75. Dabeva MD, Shafritz DA. Activation, proliferation and different ion of progenitor cells in to hepatocytes in the D-galactosamine model of liver regeneration. Am J Pathol 1993;143:1606-20.